When we talk about trucks, the first thing that comes to mind is the large size of the car. But many do not even know what a huge size modern cargo engines can reach. Let's make a rating (top-3) of the main giants. Bronze deservedly receives BelAZ 75600. So far it is the largest truck produced in the CIS. The maximum carrying capacity of the BelAZ is 320 tons, the mass at full load is 560 tons, the length of the dump truck is 15 meters. In one hour of work, he burns more than 500 liters of diesel fuel. The power of the engine is more than 3.5 thousand horsepower, and the engine capacity is 77.6 liters. The maximum speed of our giant is 64 km / h. Caterpillar 797B earns silver. At the same time he and the most stuffed with electronics among other dump trucks. Its gross weight is about 624 tons, and it is able to take 345 tons of cargo on board. 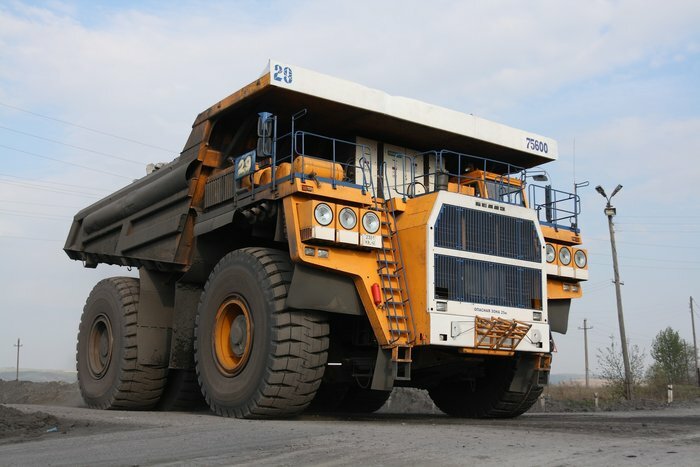 The Caterpillar 797B has the largest 24-cylinder engine among trucks, with a displacement of 117 liters. This mastodon speeds up to 68 km / h! first place goes to Liebherr-T282B! The giant's total weight is 592 tons, with a maximum load equal to 363 tons. The length of such a colossus is 14.5 meters, the maximum speed can reach up to 64 km / h. The distinctive features also 20-cylinder engine, with a capacity of 3.6 thousand horsepower, working volume of 90 liters.